Spyder LED tail lights are a lighting system that can be mounted at the rear of any vehicle for better signaling. 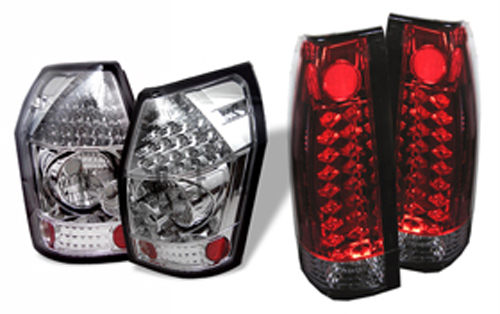 There are many types of Spyder LED tail lights available, and they come in so-called “Euro” style, which is red and clear, or in chrome on the Tacoma. There are also some blacked-out types that look good on black trucks (or dark-colored vehicles in general). Spyder LED Tail Lights can be mounted to any Tacoma and add a little bit more styling to your pickup. Who These Are For: This tail light is for anyone who wants to add some style to their ride, with the added benefit of making your vehicle a bit easier to see at night. Compared to traditional stock tail lights with incandescent bulbs, the LED’s in a set of Spyder Tail Lights illuminate faster (albeit only .2-.5 seconds faster) and they’re brighter too. What Owners Say: A lot of people buy Spyder Tail Lights because they are easy to install and look great on any vehicle. They also offer improved illumination for people following and also for backing up at night. Who Makes Them: Spyder LED Tail Lights are manufactured by Spyder Auto Group. For nearly a decade, this company has sold a wide variety of vehicle lighting accessories. They specialize in wholesale distribution, with a long list of automotive products to choose from. In addition, Spyder also sells projector headlights, mufflers, filters, sports mirror front grills and spoilers. If it’s an accessory that enhances a vehicle’s general appearance, Spyder probably sells it. Spyder LED Tail Lights ranges from as little as $65 to nearly $500, depending on the vehicle and the options you choose. Check out AutoAnything.com and VividRacing.com to find the best price.